Bangalore Metblogs » Orange Sky!! No this is neither a Photoshop effect nor sky from mars, it continued to rain since early evening y’day and while sunset the ambient light just spread it’s orange tinge all over the city. Indeed a rare and wonderful sight!! It was an amazing feeling just to experience this phenomenon. 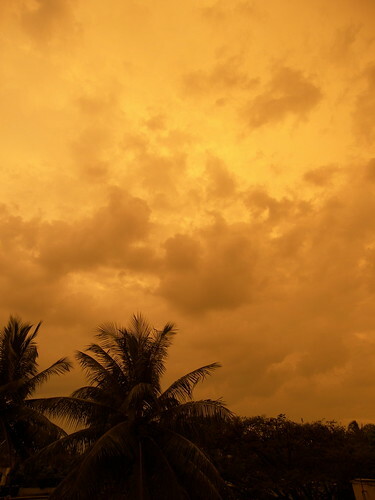 I remember these orange tinged skies from pre-monsoon showers in May – never in March! true! i just loved it!! Just then I was driving back home last evening. Apart from the portion of sky in front of me, I could see the full sky behind me in the rear view mirror on the quiet, not-at-all conjested peripheral ring roads.. totally enjoyed!! btw why has it been made that only registered users can comment? I think you could see the less number of comments fallin in compared to what it was before. I have written a few important stuff like this to you guys following the ‘Get in touch’ link. But no response yet :( a lil bad on that part. It was amazing. Its not orange. Its gold. More than the skies, it was down around that it looked more beautiful. I tried to take a snap on my mobile. Alas! it has this ‘auto’ correction software that neutralized the images. What a pain to comment here.